Long Cane Raspberries are your opportunity to benefit from a massive breakthrough in Raspberry fruit production! With Long Canes you will get fruit in the first season, because they have not been cut back - they are harvested at about 1M or more tall, and will fruit this Summer. Glen Ample is a great garden variety, not too vigorous yet fruiting early to mid-season in July and August, and producing good bright red sweet fruits - You will get around a pound of fruit or more per cane for 4-5 years. Glen Ample will fruit on the full length of the virtually spine-free canes you recieve so do not prune them down when you plant them! Summer fruiting variety fruiting from July and in to August. Supplied as Long-Canes 1M tall which means you will get fruit this year! Long Cane Raspberries are your opportunity to benefit from a massive breakthrough in Raspberry fruit production! Raspberries usually produce their fruit on the previous year's growth of canes. However, they are often sold in garden centres cut back as short canes - great value, but you have to wait an extra year for fruit. Now, with Long Canes you will get fruit in the first season, because they have not been cut back - they are harvested at about 1M or more tall, and will fruit this Summer. Glen Ample is a great garden variety, not too vigorous, yet fruiting early to mid-season in July and August, and producing good bright red sweet fruits. You will get around a pound of fruit or more per cane for 4-5 years. Glen Ample will fruit on the full length of the virtually spine-free canes you recieve so do not prune them down when you plant them! If space is at a premium, grow them in large pots in a wig-wam form it will look great and also produce massive amounts or fruit in the minimum of space! Otherwise plant in rows about 60cm (2ft) apart, using supporting wires for easier fruit picking. 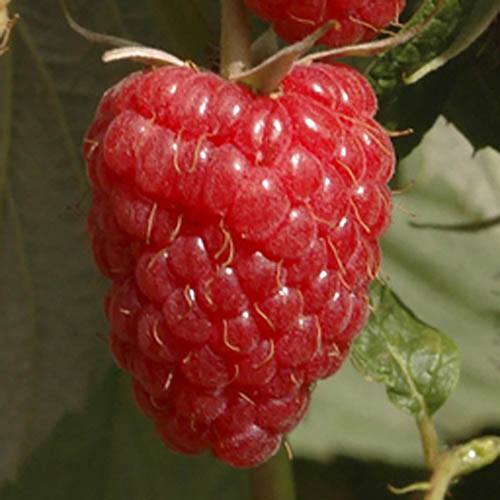 Take advantage of new Long Cane Raspberry production techniqiues for bigger and quicker crops. Summer fruiting variety fruiting from July and in to August. Supplied as Long-Canes 1M tall which means you will get fruit this year! Produce up to 500g of fruit per cane this year and over double that in years to come!